»it's life»shoo — or shoe! Never underestimate the power of a woman. 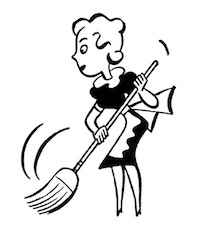 And never underestimate the power of a Jewish mother-in-law with a broom when you dare to enter her domain. Literally. Because my tiny but mighty mother-in-law recently faced down a snake in her living room — a snake which then slithered away, its proverbial tail between its proverbial legs. She was just watching TV one evening last week in her southern Florida condo (Seinfeld fans, think Del Boca Vista) when she looked down and saw a snake crawling across the floor. She id’d the perp as about two feet long with a red stripe — and then she took action. From her closet she got a broom (does anyone but Jewish mothers-in-law still use a good old-fashioned broom?) and approached the intruder, all 4 feet 11 inches of indignation. “Out!” she ordered, but the snake just looked at her with major snake attitude. “I said, out!” she repeated, but the snake just laughed its snake laugh. Realizing it had met its match — and with broom bristles providing guidance — the snake slid out of the living room double-time, onto the sun porch, and then back into the grass, a petite Jewish woman with her broom casting a long shadow over its getaway. My mother-in-law may be little, but she’s big on moxie. She’d be even taller in a pair of snakeskin pumps. Slight embellishment, but thoroughly entertaining. And, by the way I am 5’1″ not 4’11’.